Over the weekend I was able to play some more beta Wrath of Heroes. As I mentioned before, their store is now live, which made things a bit more interesting. Going in I had no intention of spending any money but in the end I bought some Gems. Purchasing the currency was very easy. Since I had an active WAR account tied to the same address, all of my payment information was already there. I could have also used Paypal and a couple of other methods as well. Everything took place inside the game with the method I chose. 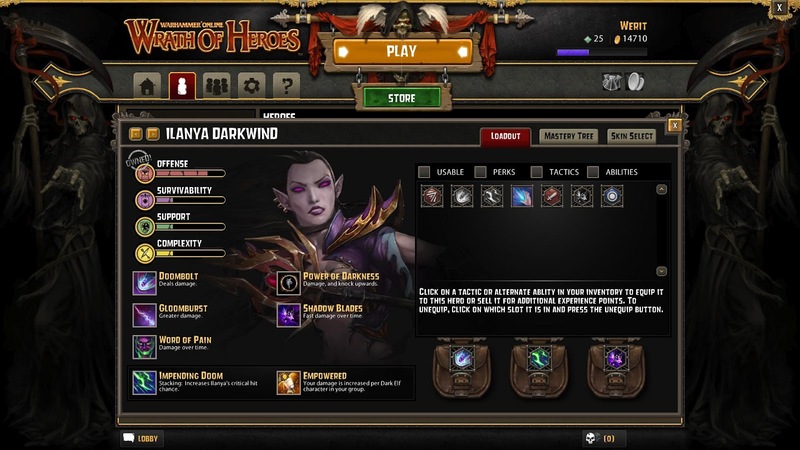 The main reason I bought gems was so I could buy my first hero, Ilanya Darkwind (Sorceress). Since it is still a beta test, the selection was rather limited so I was playing her a lot. I really wanted to be able to customize her, which requires that you own the hero... so I bought her. Heroes can also be purchased with Gold, the in-game currency. I actually had 30,000 gold when the beta started, but I accidentally bought two Wooden Chests. These random boxes yielded me 2 new tactics, which were decent enough. That left me far short of the Gold I needed for Ilanya. Speaking of Gold, right now you gain it way too slow, or items cost way too much. Let's say you make, on average, 100 gold per match which is a good amount especially if you are soloing. That means it will take 300 matches to get 30,000 gold. 10 minutes per match average and it'll take you 50 hours. That seems rather high to me. This is still beta though, so hopefully it will change.